If you enjoy the heights, amazing views and exposed places this via ferrata climb is just for you! You will see picturesque Mojstrana village, the great upper Sava Dolinka valley and the full Karavanke range. During the summer a late afternoon evening climb in the shade is much better than the morning activity, but in the spring and the fall you can enjoy and keep warm on the sun during the whole day. Variety of the routes and their difficulties makes this activity suitable for experienced mountaineers as well as families and beginners. Wild Alpine flowers growing next to the path will bring smiles to your faces and make this experience even more unforgettable! Anyone who can hike can walk or climb a via ferrata – no previous experience is necessary! If you are not afraid of heights, and want to experience the majestic of the mountains from a different perspective, than via ferrata climbing is for you. Your children should be at least 8 years old to join our groups. Families with children aged 5-8 need to book a private tour. 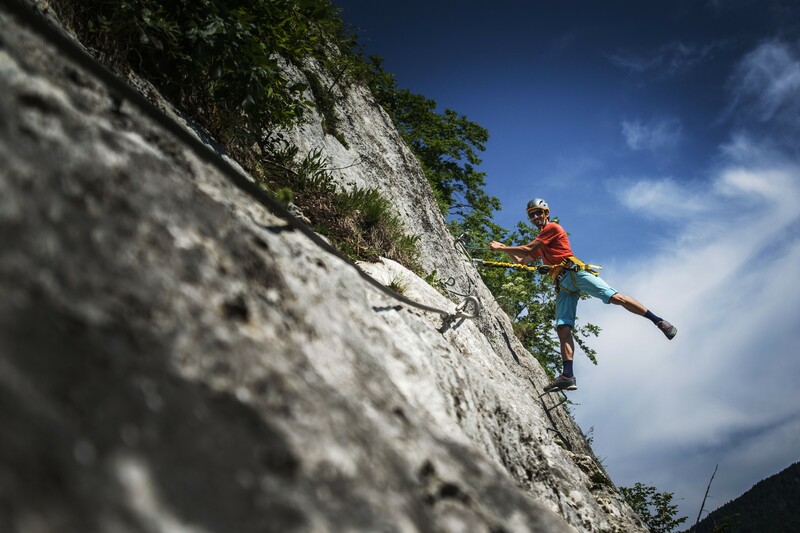 70€ per person – the price includes transfer from Bled or Kranjska Gora, via ferrata equipment (climbing harness, via ferrata set and a helmet), and a great and experienced IFMGA mountain guide. Set inside the beautiful Hladnik (The Cooler) canyon we have set up an amazing via ferrata road. From the refreshing abient inside the canyon you will be able to enjoy the views over one of the most beautiful mountain ranges in the Julian Alps - Mt.Špik range and Gozd Martuljek village. You will be crossing the river over the hanging cable bridges and climb next to the crystal-clear waterfalls. The canyon is diverse and refreshing with a new surprise waiting behind every corner.